For help with Windows 10, click any of the links below. What is Windows 10 Fall Creators Update? What is Windows 10 April 2018 update? How to create a Windows 10 installation disk. How to create a copy of Windows software. How to change the icon of a folder in Windows. All directory and folder-related questions and answers. How to disable a video card. All e-mail-related questions and answers. How to disable the Windows password prompt. How do I disable the Windows User Account Control? How to enable and disable the Microsoft Windows Firewall. Opening port for program or game in Windows Firewall. What is the Windows command line? Microsoft Windows STOP 0x0000007F error. What is the thumbs.db file? 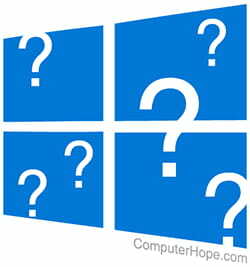 What is Windows Program Files and Program Files (x86)? What are the $NtUninstallKBxxxxxx$ folders in Windows? What is the Windows lsass.exe file and process? Information and help with Windows svchost.exe. What is the Windows alg.exe file and process? What is dwm.exe and why is it using so much memory? Screen saver no longer stops after installing the Creators Update. How to customize colors in Windows 10. How to reactivate Windows 10 after a hardware upgrade. Control Panel missing from Windows 10 Power User menu. How to keep the Windows Taskbar hidden. Enabling and disabling Windows desktop cleanup. How do I prevent messenger pop-ups? Enabling or disabling automatic updates. How to set the path and environment variables in Windows. How to change the Windows compatibility mode. How to change the language in Windows. How to change the Windows lock screen. How to disable the Windows low disk space warning. How to use the Windows recovery console. Disabling the Microsoft Windows System Restore. Where do I download the .NET framework? How do I change my Windows screen saver? How do I remove the Bluetooth icon from my Windows desktop? How do I make the Windows My Computer icon the first icon? Missing the Windows desktop My Computer, My Network Places, or My Documents icon. Unable to find icons in Windows Control Panel. How do I change Windows notifications? How do I disable Smart Window? Show unused drives in Windows. How do I run a program as administrator in Windows? How to view Windows virtual memory or page file settings. Is it a good idea to change my Microsoft Windows page file size? How do I switch users in Windows? How to create a Windows Restore Point. How do I make Windows not automatically restart after update? Why does my computer not come with a Windows CD? How can I make my version of Windows a genuine version? Differences between Normal and Safe Mode in Windows. Windows freezes or reboots repeatedly upon startup. How to access the Event Viewer in Microsoft Windows. How to identify what startup programs are safe to disable. How to perform a system image backup in Windows. How to uninstall a Windows 10 upgrade. How to show or hide desktop shortcut icons. How to turn off fast startup or hybrid sleep in Windows. How to remove unused icons from the Windows desktop. How to enable the Windows Script Host service. How to select, change, or download a Windows theme. How to enable the Start screen in Windows 10. How to install WSL on Windows 10. How do you create a recovery disk in Windows? How to block access to the Control Panel. How to enable voice activation for Cortana. How to create, arrange, and remove Windows desktop icons.